Tino and his beloved Bishop Reyes Cathedral face another sunset. I knew this would be an interesting photograph. 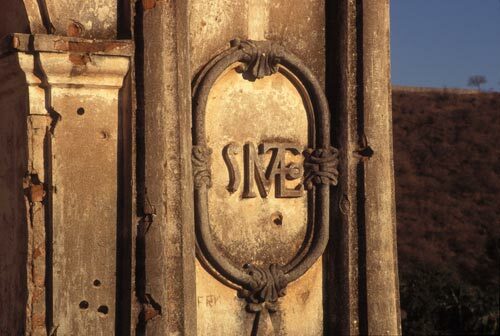 A man, who, in his face, had seen much of what life has to offer, a church bell framed by its belfry and a natural backdrop stretching from Mirador to Sierra Madres. All were lit by a low brillant sun whose golden rays were diffused by humid shimmering heat waves. We only had a moment to take this photo, as we were speaking he was summoned to fix a pressing property emergency, this is what maestro Tino did. I asked him to look towards the sun and pressed the shutter button. One click and done, another moment saved for the future, this is what Anders does. 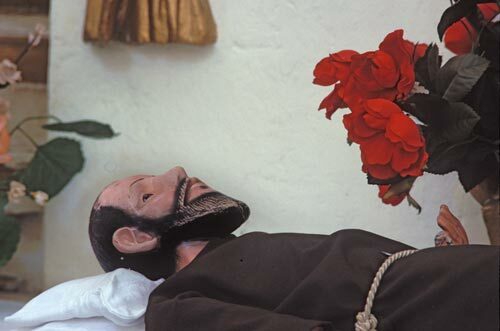 Caretaker of Nuestra Senora de Balvanere Church in nearby Aduana. La Aduana on a midweek day in late Spring is peaceful. Take away the sounds of birds, insects, burros, dogs and a handful of kids and it is really quiet. Few cars will be heard for hours. thousands of pilgrims arrive in La Aduana, many walking along arroyos from Alamos, to honor the Virgin of Balvanere every November 21st. A breeze kicks up dust on an empty road, a crow calls, three boys in a dry creek bed laugh and the day moves on. Life in Aduana 1996 is much different than life in Aduana 1700, one can only wonder what it will be like in Aduana 2020. A tale of two bells, one old, one new, and how they toll. The bells of Bishop Reyes Cathedral are part of Alamos’ daily fabric, they are a prominent voice in a complex orchestral sonic landscape. Here are old and new: a cracked bell was replaced by a shinny bell. I was raised to believe if you don’t have something good to say about something don’t say anything. This is a good rule of thumb, especially in small rural communities. There are always exceptions: this new bell didn’t make me feel good. It wasn’t inviting me, its clang was more of a warning. 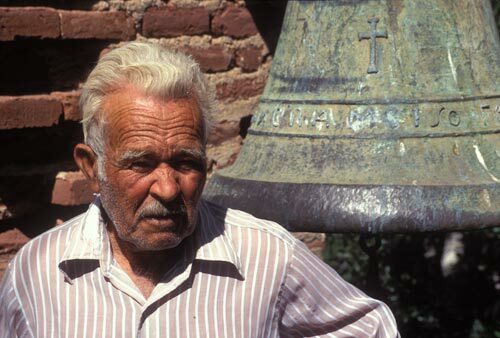 It is possible that the bell vibrates discordantly only to me, but I find this hard to believe, I have a good ear. Maybe it was the bell ringer’s technique. 14 years have passed, maybe it has mellowed with age. I hope so. A town so culturally rich should have a bell that touches the heart and inspires the imagination. Maybe it does now. Dr. Ortiz Tirado is another Alamos native that touched the world. 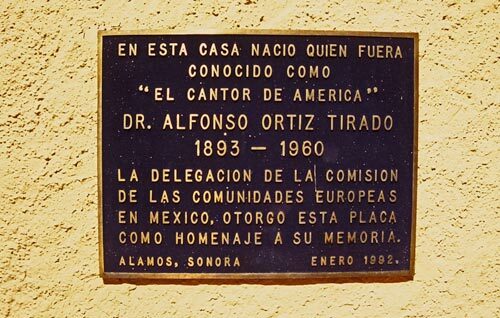 Dr. Ortiz Tirado was born in Alamos and spent his early tears in Culican, Sinola before moving with his newly widowed mother and family to Mexico City. He became a successful doctor specializing in plastic surgery and was Frida Kahlo’s bedside doctor. He made vast contibutions to the medical world. And he could sing. His beautiful tenor entertained audiences across continents. 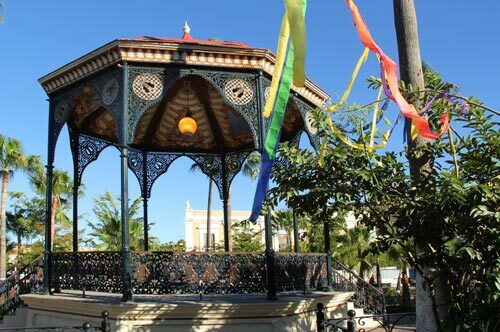 Alamos hosts a grand music festival in his honor, The Festival International Dr. Arturo Ortiz Tirado, that includes dance, art and music with workshops, lectures and concerts. The festival entertainment, centered in Alamos, also performs across Sonora visiting venues in Nogales, Hermosillo, Ciudad Obregon, Hutabampo and Navojoa. The ten day event is held each year in late January. 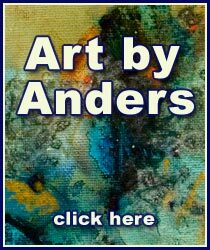 ©2012 Anders Tomlinson, all rights reserved. 1984, It is a quiet day in the well-maintained Plaza de Las Armas. 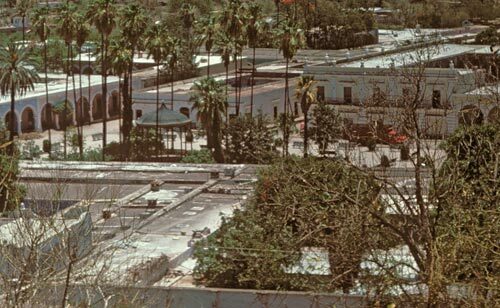 Looking down at the Plaza in the Spring of 1982. Photo: Kit Nuzum. with magic sunrise-sunset light, is a stunning vista from the Kiosk. Álamos, was dedicated on September 15, 1904. And the music continues on. 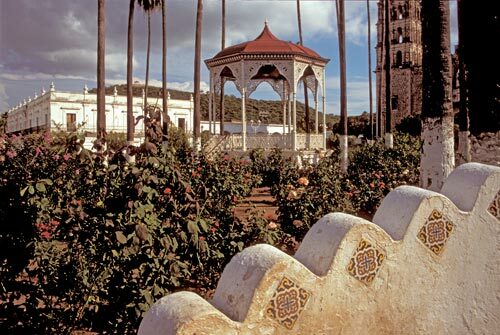 1996, large rose bushes filled up the park surrounding the Kiosk. 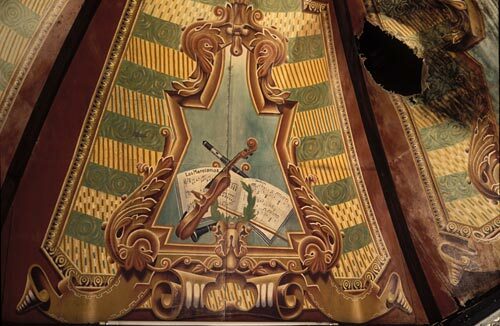 concert with the hands of time as man restores, rebuilds and remodels. 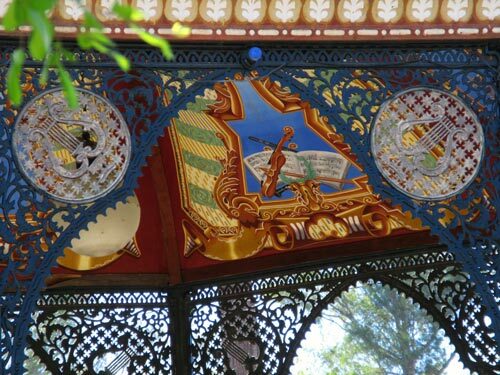 Restorers begin work on the inside panels of the Kiosk canopy. Music is part of the fabric that is daily life in Álamos. of the panels just before these men started to remove them. There is wear and tare as days, becomes months, become years. of unrelenting gravity is never done until there is no more to steward. 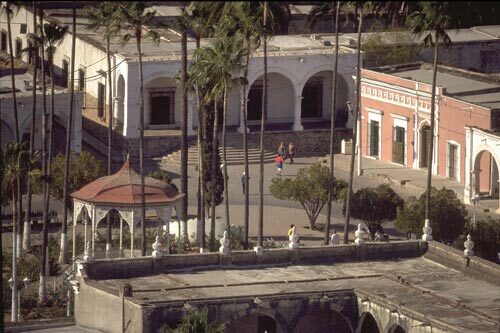 A bird-eyes view of Plaza de Las Armas as seen from Mirador. Álamos, and the interaction of its citizens, is evident in this photo. been here for over 200 years. Kiosk scenes and details from 1996. 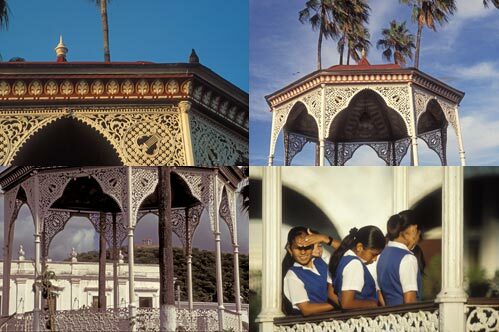 The Kiosk can be a place to be seen and a place to look out and see. Carnival come to the Plaza in late February 2017.
same, this is true for much of Álamos, Sonora, Mexico. The beauty is in the detail for all to see and appreciate. Nighttime is a special time in the Plaza, most weekends there is an event. for another night as it has been since 1904.
as a film crew captures the event. is surrounded by adolescent girls and an scattered smiling mothers. Spring Day in the Plaza – Part Two: Getting Ready for another Day. This is a Blessed Season for a Multitude of Reasons. complex in its textures and atmospheres. All photos by Anders Tomlinson unless noted. There always seems to be someone, or group, inside the church. 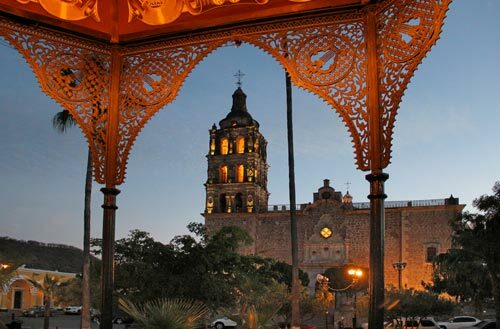 Bishop Reyes’ Cathedral takes up the entire southern side of the Plaza de las Armas. Its three tiered belfry towers above town and touches low passing clouds. Along with multiple daily services the church is also a religious classroom. 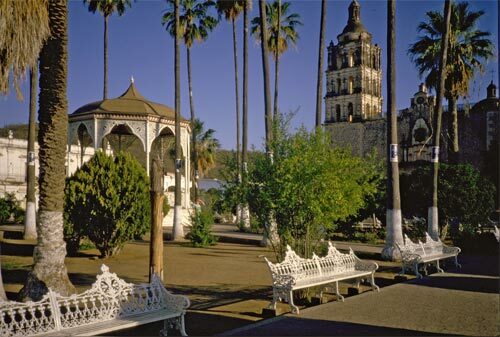 Jesuit missionaries founded missions in southern Sonora between 1613 and 1620. Early settlements grow around a mission protected by a fort. The early Jesuits brought Catholic teachings to the Indians as well as trade and farming skills. Think of all the people who have walked on this floor and sat in these pews. Imagine hundreds of voices reverberating off these walls as they enter and leave the church and the wonderful choir filling the space with song during services. And there is always the church bells tolling time 24-7. 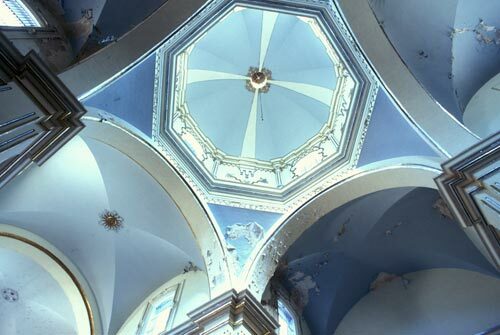 The Cathedral's high ceiling atmosphere creates its own sound and weather. Grandeur on a human scale. No matter how and where one lives this is an extension of their house. It is their communal living room. It is a place that they can come and be with others or be by themselves. It is their place in their time for all of time. Parish Priest Don Pedro Gabriel de Arago in 1735 reconstructed La Purisima Concepcion, on the same site as of the originalt small Alamos church made from adobe and cut rock with a beamed ceiling. A 1736 inventory by visiting Bishop Martin de Elizacochea Dorre Escheverria noted all the church’s religious objects were silver except for the gold shrine and chalices. Here one can come, rich or poor, and be part of something larger. This is a place of words, music and prayer. As I was taking these photos I watched and listened to praying individuals scattered across the front pews. The intensity of their prayers spoke of their needs or losses. Before me was the human condition in the court of last appeals. 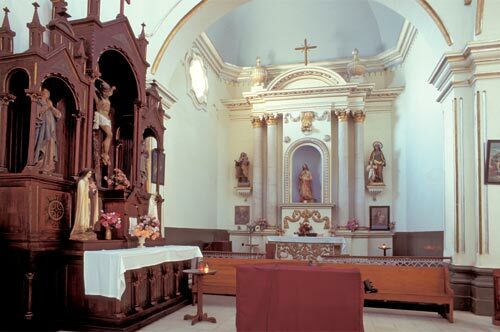 King Carlos III in 1781 ordered a new diocese for Sonora, Sinaloa and the Californias. Bishop Antonio de los Reyes was stationed in the then capital of Arispe in 1783. A few months later he moved to Alamos to avoid Indian raids. Bishop Reyes started to build around and expanding the old church. Services continued here, on the same site as the present cathedral. 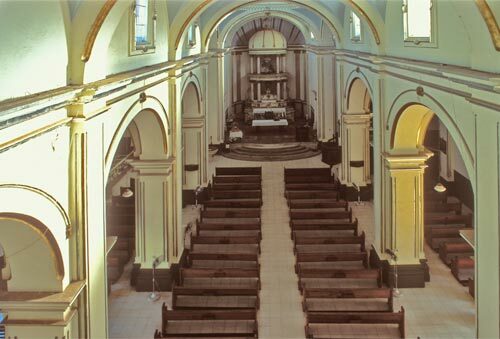 The old church was torn down in 1794 when the new cathedral’s walls were ready for rafters and supporting columns. Don Juan Ross was, according to church records, the first contractor. He received a payment of $11,250 pesos in 1786. 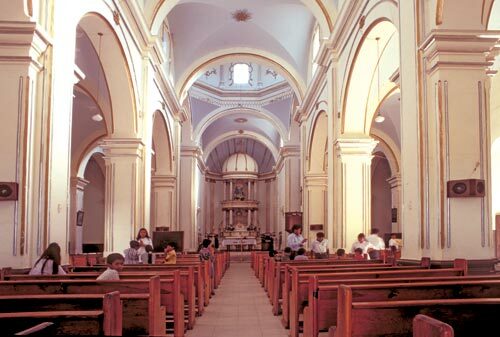 The cathedral was finished in 1803 under the supervision of Father Camilo Sanmartin. 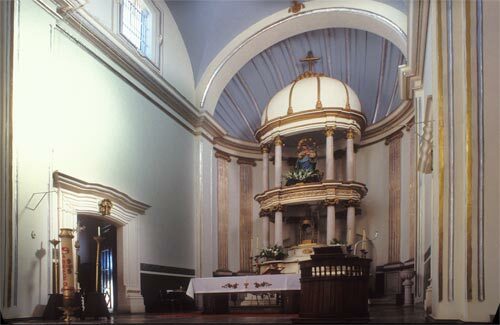 The silver and bronze altar rail was made in Oaxaca. A silver candelbra and lamps provided manmade illumination. This was a fine cathedral, simple but commanding on the outside and elegantly reassuring on the inside. Life is not easy, on many levels, and sanctuaries like this ease the pain. 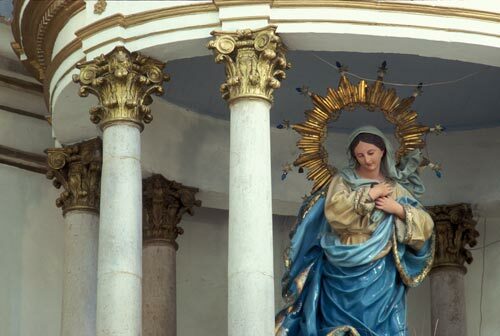 In the home of God, there is handcrafted furniture, art, sculptures, color, gleaming metals, proportion and design. Natural light streams in. 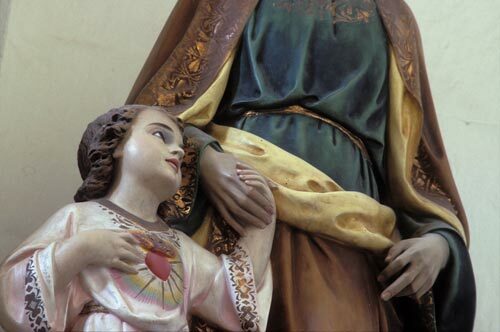 In this home of God, Catholics gather and take on life together as a huddled mass. Outside, it has been forever changing as modern times evolve. Inside, it always strives to remain being a continuum of the past, above and beyond forces of change. Life is not easy for the church-goers and it is not easy for the church. From 1855 to 1861 the War of Reform, church against state, raged on between church members Conservatives and reform minded Liberals. Benito Juarez had created laws that limited the church’s powers, privileges and holdings. Don Jesus Gandara led the Conservatives against General Ignacio Pesqueria’s Liberals supporting the new federal laws. During the war Alamos was won and controlled by both the Conservatives and Liberals. 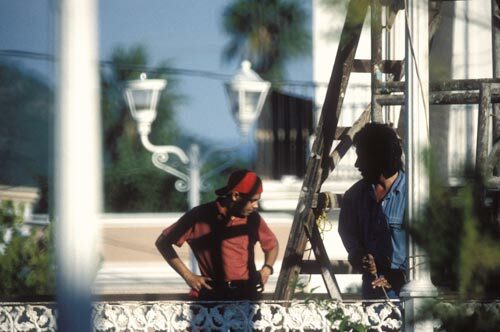 At times, Alamos citizens were engaged against each other. In 1859 Apaches reached the Alamos district. Alamos Mayor Manuel Salazar came to a peace agreement with the Indians in December 1859. And then the French landed troops in Vera Cruz in December 1861. Conservatives and Liberals ended their War of Reform and came together to defend Mexico from foreign invaders. 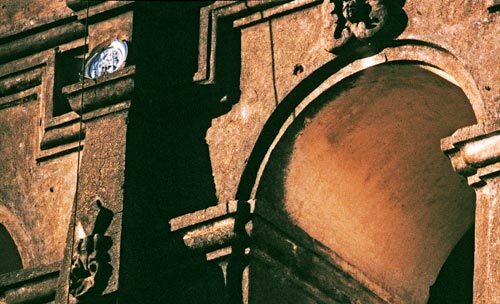 These were tumultuous times surrounding church and state and Bishop Reyes’ Cathedral stood its ground, as it does today. Through the years weather and armies have laid siege on this church. It is true, it is not easy to maintain Bishop Reyes’ Cathedral. There are issues of scale, materials, gravity and weather. 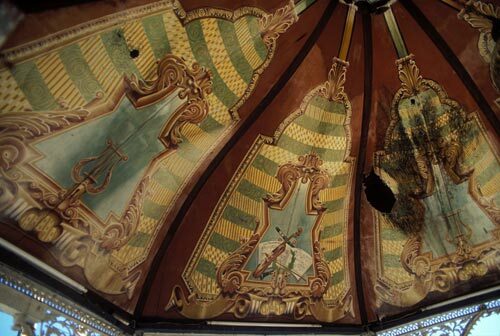 And warring man has shot at it, broken in and plundered over the years. The church is a symbol respected by many and held by others, through the years, in low regard. General Angel Martinez on January 7, 1866 near Alamos defeated the Imperialists commanded by Colonel Jose Maria Tranquilino Almado. 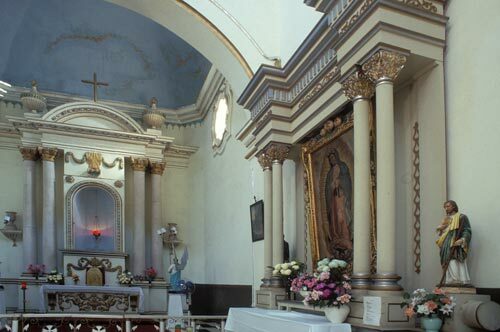 General Martinez ordered that the church stripped of any precious metal that could be melted. During the next twenty years days of peace were few and far, scattered between unending revolts, battles, wars and plundering. And through it all, to this very day, winds and rains made life for the Cathedral a battle of man’s maintenance against nature’s forces. The original designers, builders and artisans would be proud that the Cathedral, their efforts, still stands. The innocence of youth looking toward a future of hope and promise. Those needing guidance and care become those that guide and care. And we all lay our heads downs to rest and our bodies follow. Religion speaks of yesterdays, todays, and tomorrows. It speaks of better days and better places. Religious followers are asked to endure and conceptually, eventually, benefit from their days of survival and struggle on this small planet. Moments of comfort and caring soothe the human condition. Detail is added to detail as we near the church’s heart, the congregation’s visual focal point and cosmic backdrop. It is here, for this moment, that all are equal under a supreme and unifying force, the power of human belief and the human drive for universal understanding. Here all seek, in their own ways, answers to what life is. There are columns that support and there are columns that sustain. 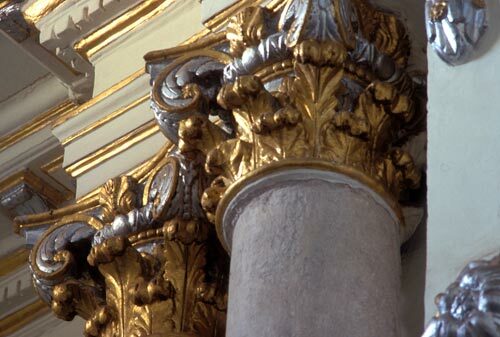 I often wonder about the artisans and workers who made columns like this. What was their human condition as they strived for supreme beauty. What was their roof made from, what did they stand on as a floor, what food was served for dinner? How old did they live to be? How many children did they have? And who has come along to restore and maintain these columns? And how did their lives differ from the one’s that came before? I would rather ask a question than give an answer. Everyone that visualizes Christ know him in their own light and setting. Humans seek forgiveness. Humans need forgiveness. 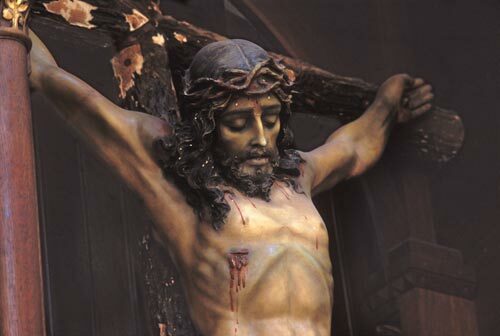 Salvation resonates and persists across humankind. It is human to feel imperfect. It is human to seek direction. It is human to come together. It is human to leave. It is human to establish us and them. It is human to protect resources. It is human to feel superior to those outside of their own tribal social circles. It is human to war. It is human to demand retribution. It is human to accept redemption. It is human to take advantage. It is human to overlook unintended consequences. Vulnerable human psyches, looking for direction, migrate across uncharted existences. Be the humans dominate or submissive, rich or poor, all humans have hope, fear, love, hate, need, desire, doubt, confidence, triumph and defeat. And so this is what the human condition has been, is and will be as suns rise and the suns set. Welcome to Bishop Reyes Cathedral. Think of the scenes it has witnessed. 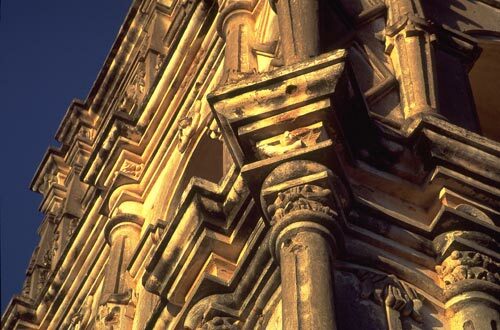 Ladies from the wealthy homes of Alamos were asked to contribute one of their fine china to decorate the nearly completed cathedral. These plates once sat on elegant dining tables and then they were volunteered to be hung outdoors and exposed to the elements for now over 200 years. Talk about culture shock. A lucky few remain in place. Here the law of equal and opposite reactions is clearly evident, etched in time..
Who fired these bullets? Was it Spanish soldiers, Federalists, Centralists, Mexican colonists, Imperialists, Yaquis, Apaches, Centralists, Conservatives, Liberals, French troops, Independents, Mayos, Reformists, Highway Men, Villistas or local teenagers having target practice? The wealth of Alamos was targeted by every political movement to finance their causes. Alamos was the place to plunder. 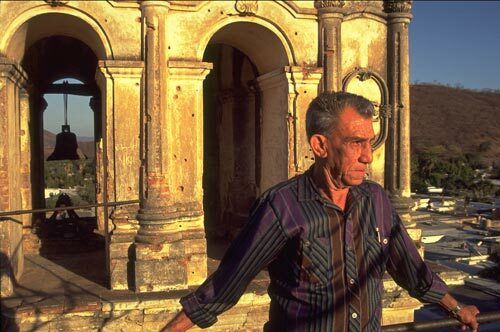 Alamos has seen the best and worst of human nature. Strong sun highlights fervent beliefs as shadows dance across chiseled features. Official records indicate that work on the church began in 1786. Alamos elected three town folk to supervise work and manage the budget. The church was finished in 1803. Today, as it always has, a cathedral bell announces the hour and half-hours and masses. Time marches on one bell peel after another, one year after another, one century after another. This is Alamos time. Bishop Reyes’ Cathedral takes up the entire southern side of the Plaza de las Armas. Its three tiered belfry towers above town and touches low passing clouds. Along with multiple daily services the church is also a religious classroom. Religion speaks of yesterdays, todays, and tomorrows. It speaks of better days and better places. Religious followers are asked to endure and conceptually, eventually, benefit from their days of survival and struggle on this small planet.